Hold onto your hats, readers, when you dive into the world of author Claire Legrand because you are about to embark on a very wild ride, that will take you deep inside an entire new culture and mythology, before slamming you repeatedly back and forth thru time. 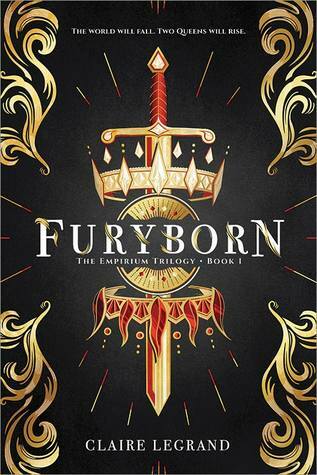 Furyborn is the story of two young women, separated by a thousand years in time, but linked in enigmatic ways that are only are only revealed slowly through this first book in a trilogy by the author. Rielle, a temple student and member of the royal court in the past, hides a terrifying secret; she may possess the power to control all seven of the elements worshipped by the people of the kingdom of Celdaria. Once she successfully harnesses these powers, she could be the prophesied Sun Queen, the protector, or her counter, the Blood Queen, the destroyer. Eliana, a bounty hunter who seeks “marks” for the empire to support her mother and younger brother, has a secret of her own. She is invulnerable, but has no understanding as to why, except for the myths of magic users and angels passed down through the ages, which have been all but destroyed by the empire that has nearly conquered her world. Each subsequent chapter of this mammoth volume switches back and forth between the two stories of the two extraordinary girls, living completely separate lives in vastly different environments. How could the two stories possibly be related? They share a world, even though they are separated by time, and the reality of the former becomes the mythology of the latter. There is also the fact that certain objects, like an unusual necklace, and the names of certain characters, which at first appearance could be only coincidental, transcend the gap of the centuries. When I first began reading this massive volume, a choice for my local book club, I admit I found the time switch confusing through the early chapters. There is a lot of information, characters, and history involved in the world building to keep track of, compounded by the fact that the story takes place in two separate time periods simultaneously. However, as I continued reading, I was able to separate the two stories, only to begin to see links between them. The trials that Rielle must face are exciting but a little predictable by the end. She conquers the elements- wind, fire, water, metal, shadows, light, and earth, in a manner reminiscent of other stories of trials of heroes. Meanwhile, Eliana faces horrors of her own in an age where science can create mutations controlled by a malevolent force, and the very soldiers of the despotic Emperor are only shells that once were human. The connection between the two main characters is explained by the end of this volume, but so many questions are left unresolved. What will happen to Rielle that leads to the situation that Eliana is in, a thousand years later? What will happen to Eliana, who is in the middle of a war against the empire? Will the angels, banished in the ancient past, succeed in returning to the world of the future and conquer it? I know this is only the first book of a trilogy, but I confess I was disappointed with just how much of the story was left unresolved at the end. I also wondered if the next two books, not yet released, would be written in the same manner, forcing the reader to shift back and forth in time. Perhaps all this suspense is a good thing, though it will be difficult to wait until the next book comes out next year to see the answer to my questions! Overall, I award this story 4.5 stars for excellent character development and world building, with a plot full of twists and turns that keeps the reader guessing. I would recommend this story to any fans of epic fantasy worlds, strong female characters, or time travel storylines. To certain individuals my penchant for reading stories about wizards, hobbits, and ghostly apparitions may seem to be an odd hobby for a woman in her mid-forties. What would perhaps surprise those same individuals more is that I also have penned a number of fantasy stories where the characters include werewolves, banshees, and virtual reality monsters. My literary tastes aside, I have found that fantasy stories as a genre offer a number of benefits for those with even the most casual interest in reading for pleasure. Sometimes the easiest way to escape from the stresses of daily life is to take a mental vacation. For me that may take the form of visiting an entirely new world, one populated by creatures from childhood dreams. I find it’s rather difficult to worry about everyday things while reading tales of an epic quest to rescue a princess and slay a dragon. Immersion in a completely alien landscape for a time can allow us to relax and recharge our minds, alleviating tension and allowing us to return to “real” life with a fresh perspective. Numerous studies have been done which suggest reading for enjoyment, of any type, can even help alleviate or alleviate symptoms of ailments such as high blood pressure and depression. To find out more about the benefits reading can offer see the article here. As the saying goes, if you can imagine it, you can do it. Sometimes changing focus for a time, such as through reading a good book, can help to find a solution to a problem that seems insurmountable. Indulging in leisure reading can help improve cognitive functions, increase vocabulary, and improve analytical skills. I encourage all readers out there to allow your favorite book, or a new find, to inspire you to think, write, and problem-solve in ways you may not have considered before. I’ve discovered one way to maintain connections with my adult children as well as my circle of friends is through a shared interest in literature. Books make good discussion topics, sometimes even more so when we don’t all agree on a particular work or author! Tip for family bonding: Don’t just read stories separately, if your children are young, take turns reading aloud with them. If they are older, give everyone a chance to read a particular book and then talk to each other about it. While my favorite works of fiction may involve characters that are not always human, the writers who produce these works still frequently manage to insert nuggets of wisdom that can be applied universally. Searching for these “truths” in the deeper meanings of a fantasy story can provide hours of entertainment, and thought-provoking discussions. For instance, consider this philosophical truth from The Fellowship of the Ring, by J.R.R. Tolkien: “Many that live deserve death. And some that die deserve life. Can you give it to them? Then do not be too eager to deal out death in judgement. For even the very wise cannot see all ends.” This quote from a novel published in 1954 contains just as much potential for controversy today as it did when the story was first written, despite the fact that it was part of a conversation between a wizard and a hobbit. Have you ever considered Tolkien, best known for The Hobbit as well as The Lord of the Rings trilogy, as a philosopher? No matter your favorite genre, here’s hoping you take the time to read a good book today!